Eros Walter Luciano Ramazzotti (born 28 October 1963) is an Italian musician, singer and songwriter. Ramazzotti is popular in Italy and most European countries, and throughout the Spanish-speaking world, as he has released most of his albums in both Italian and Spanish. Since 1984, Ramazzotti has released 11 studio albums, one EP, three compilation albums, three live albums, and 37 singles. He has sold over 60 million records in his 30-year career. 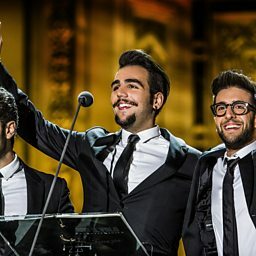 His repertoire includes duets with artists such as Cher, Tina Turner, Andrea Bocelli, Patsy Kensit, Anastacia, Joe Cocker, Julio Iglesias, Lynn Davis, Ricardo Arjona, Luciano Pavarotti, Laura Pausini, Nicole Scherzinger and Ricky Martin. Ramazzotti first gained international success in 1993, with the release of Tutte storie, which amassed five million album sales and occupied the top five in every country where he had previously released albums. This success led to a BMG International record contract in 1994. His audience appeal comes from several factors, including his unique voice, which can be described as somewhat nasal but nevertheless forceful and resonant baritone, and his energetic delivery of catchy, melodic tunes which are often passionate mid-tempo autobiographical ballads, with instrumentation that is rich in soft-rock influence.